Jatujak in Mall of Asia! Before heading off to watch the Chinese Acrobats, Korean Paper Doll Lanterns, and the Italian Light Display, I would recommend to eat in this no-non sense Thai place called Jatujak in Mall of Asia. It is located in the second floor , entertainment mall near the center. It is named after the famous Chatuchak weekend market in Thailand and owned by a Filipino. This is what a filipino thai food should taste like and you can order your sukho thai favorites and fulfill your thai craving. We think that it is decently priced and the food is good. Thai Iced Tea (P65++). Pricey but it contains condensed milk which makes it yummy. Tom Yum All-Shrimps (P165++). Tasted more of Sinigang and way too salty for us. Bagoong Rice (P130++). Just OK and it is what you expect it to be. It has chicharon which was good not for the health though. Chicken Sate (P150++). We loved the sate sauce with its cucumber side dish. Pad Thai (145++). Decent and a lot better than the Som’s Pad Thai. Tapioca in Pandan Cups (Tako) (P68++). The consistency was not the same as the original Thai Tako but it was big enough to satisfy your craving. There were kamote and sweet corn bits. i really miss the philippines when i read your blog. @ lara: Although I, too, miss Flavors & Spices, I wonder if it will ever reopen as its owners closed it and their other resto, La Primavera, when they emigrated to sunny Spain. Are you kidding? This place has THE worst Thai food since Thai in a Box! And my friend got indigestion from their weird tasting iced tea. The best item here is the plain rice. any other thai resto that you could recommend? now THAT looks like some really good chicken sate!! ooooooh and i love love love thai iced tea! I was just there this evening and you’re absolutely right about the Tom Yang being too salty. They use too much patis in the broth, although I would think that this would be an easy problem to resolve. We had the chicken sate(good), tofu and vegetable curry (slightly sweet but not bad), squid with cilantro and garlic (slightly undercooked but flavor was okay), and the bagoong rice. If you’re in Bangkok, do try the powdered Nestle Thai Iced Tea. For a powdered product, it’s suprisingly good. their chicken sate is super super yummy! I agree, Muang Thai is the best thai resto in QC. Hi Anton, i just want to say that i enjoy reading your blog although this is the first time i would post a comment since finally we are talking about my favorite restaurant in manila. To me, being in Thailand for so long, Jatujak really came too close to the authentic taste of Thailand’s famous dishes. Yes i agree, since i eat there every weekend, there will be times you will find a little inconsistency in the taste of their food but i have witness so many times it best mixture. I had the chance of talking to one of the owners, very nice person who works for another company, and mentioned that they are advocates of the Thailand and everything in it, so they travel most of the time buying authentic ingredients in Jatujak. Even their curry is imported! that is why it really, for me is the best in Manila. I have tried other restaurants such as People’s Palace which i found really good too but extremely pricey. Also, I have tried Thai Silk in Serendra, all I can say it is too commercialize and its taste doesn’t come any close. I would always have Jatujak next to my heart and next would be Soms. All the rest is just fake for me now. You should try the lemongrass ice tea…really good and it can fight cancer. Jatujak….I’m never going back to this restaurant again. I found a COCKCRACH in my ice tea!!!! I was so sick after I threw up 5 times. Its COCKROACH!!! sorry for the wrong spelling. I think I’m too sick to type the correct letters. I love their spring rolls!!! 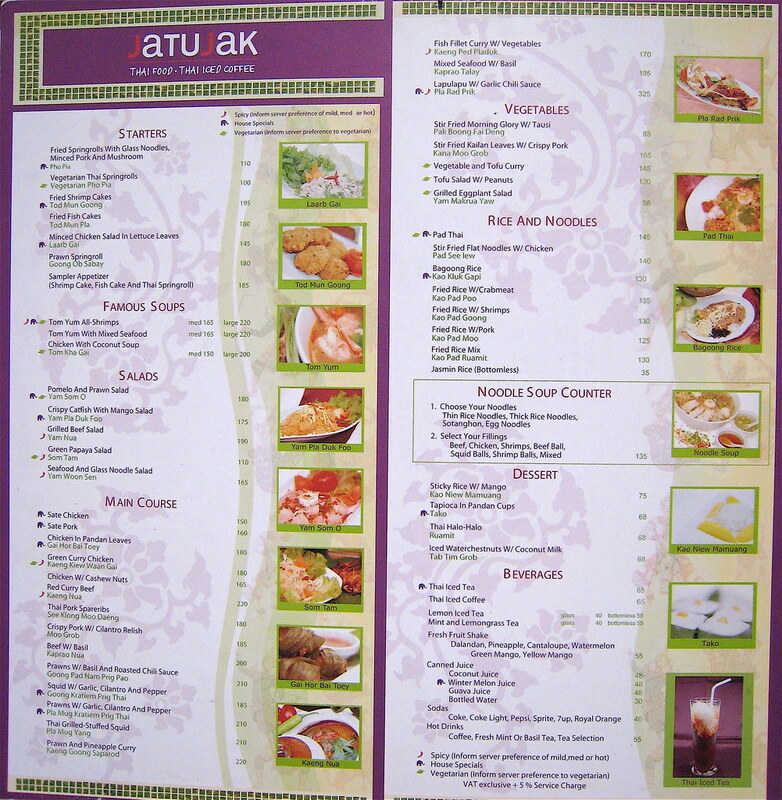 Hello been to jatuchak resto in MOA everytime i do my vacation in manila ,your food reminds of Thailand …. The precious moment i spent with my loveones in your place.